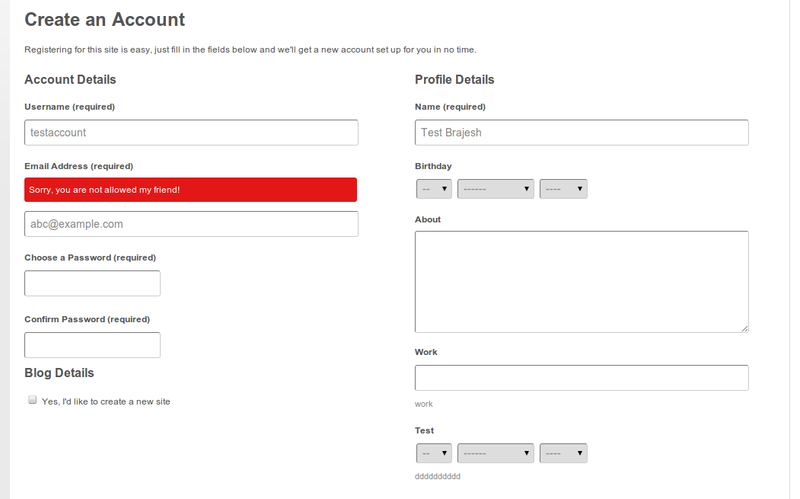 This plugin is best suited for intranets, educational institutes or the cases when you do not want to allow registration from everyone but a subset of users based on their email address. 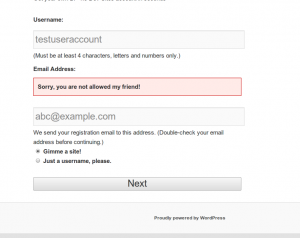 If you want to limit registrations on your WordPress, BuddyPress website to the emails belonging to only specified domains, this plugin is for you. It goes one step further and allows you to allow users by emails, or domains or even the domain extensions. So, if you are building an educational website and only want to allow the users from .edu domain, just put .edu in the settings. Same goes with the domain. If you are building a corporate network and only want to allow users from your own network, put your domain name in the settings. It’s easy and efficient. The use of regular expression gives it a lot of flexibility. 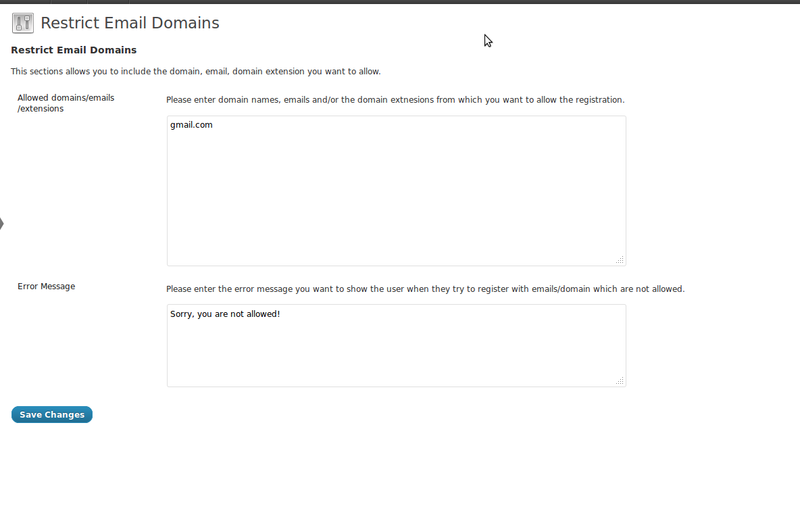 After activating the plugin, you can access it from Dashboard->Settings->Restrict Email Domains. Hope it helps a few of you. Looking forward to hear your suggestions for further improvement. I am also running your version of BP MultiNetwork which is great. 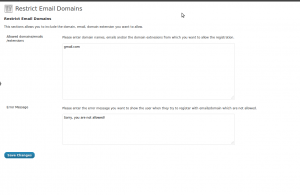 For Restrict Email Domain in my WP Multisite/BP MultiNetwork configuration I am activating the plugin at the site level. However, when I change the domains on site A the setting are changed on site B.
Hopefully there is a way to make the setting independent by site. This is great. Is there something like this for discussion settings? i.e. I want to restrict the posting of any comments unless they have a specific email domain. This would be ideal for our college website. I want to know if buddydev plugin will work for my classipress site. It works if I put gmail.com but not just on the .edu tag. i am sorry for the inconvenience. Please allow me 15 minutes to check it and get back to you. Thank you. Ill be headed to sleep now, but I will check back tomorrow. There was a bug. We have updated the plugin, please upgrade to 1.0.4 and It will work properly. Hello, I’m having a very odd occurrence. Working on my localhost / WAMP. Basically, I put a bunch of domains allowed in listing, gmail.com, yahoo.com, etc. BUT instead of allowing those email domains to register, it denies those email addresses, while allowing random email addresses like zyd.com to register. Any help would be appreciated. Thank you. Each entry needs to be on a new line and there is no comma. Please try that and let me know if that works for you or not? Any other suggestions? This would be nice if it worked, to be honest. Oh, I bet its something with my custom registration page? Let me go check… and have an answer for you soon. Nope, its working even with default registration page. Any suggestions? 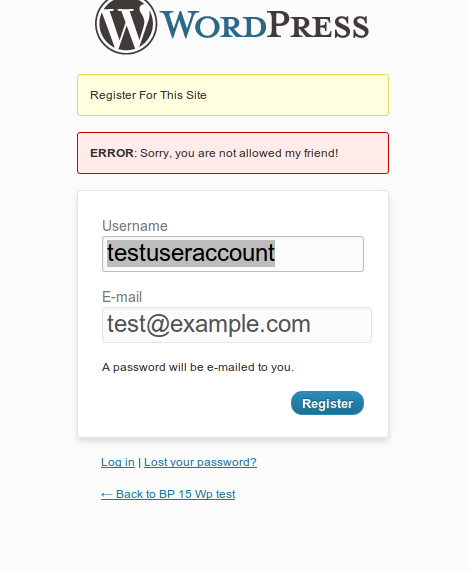 Sorry, correction: it’s NOT working with default buddypress registration page. Wait, I think I may have found an issue… I will update soon. It was a bug in the plugin. 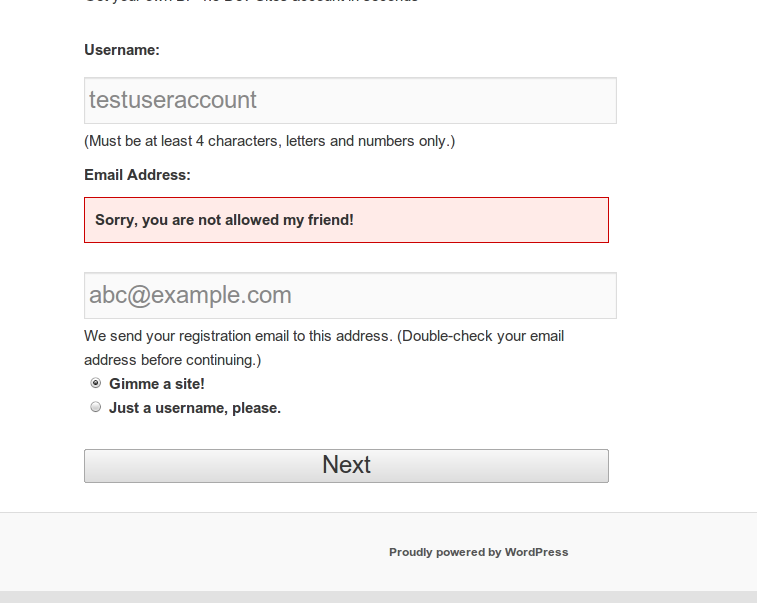 It was mistakenly testing for the no. of matches. Please upgrade to 1.0.5 and let me know if that solves it. Yes! That was it! Thanks for the fix! One more problem -> if I have a list, say with yahoo.com, if the person registering writes name@Yahoo.com or name@YAHOO.com, or any other variant that is not exactly as written in list, in this case yahoo.com with all lower cases, it WILL FAIL 🙁 Do I have to write all variants of domain names in the list? Yes, that needs improvement. Please allow me 10 minutes to put an update. Thank you for your hard work and energy…and of course, I apologize for bogging you down with more work. Thank you too for your patience. Please upgrade to 1.0.6 now. It allows case insensitive match for emails. Also, There is no need to apologize, you are helping me improve the plugin. I sincerely appreciate it. After removing a domain from the whitelist, will it still block the login of existing users that already registered with that domain? No, It will only block the domains which are not present in the list. It seems you are referring to our other plugin. but afterwards, when i remove a domain from the whitelist, all users that were using that domain should not be able to login anymore. I mean not only the registration restriction, but also the login restriction for existing users when their domain is removed from the whitelist. After reading your comment, you are looking at the right plugin. The other plugin is Ban registration domain(You don’t need that as it bans the domains listed in the option). 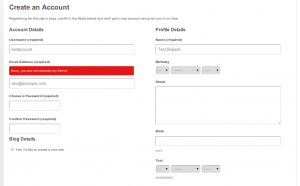 This plugin will serve your purpose for the registration but not for limiting login.